Family members can request a copy of their family relationship records ( JaeJeokDeungBon, 제적등본 ) from government offices in Korea ( ShiCheong 시청 city hall, or DongSaMuSo 동사무소 area office ). These records are a great way to start Korean genealogy research. Often you can get about 100 years of family names, dates, addresses, and relationships for several generations. The names are normally in HanJa characters, which is the most useful form of a Korean name for genealogists. You can use that information to know what to search for in a JokBoto find even more ancestors. There is a small fee for a copy of the records. You can also request them online at efamily.scourt.go.kr . You may need some information like the name, national id number, and the BonJeok 본적 family origin place, and proof of the relation of the requestor to the family. Note that some records from the time of the Japanese occupation of Korea might have Japanese, but most of the records will be in Korean HanJa characters. A video tutorial was added in the new Tutorials section. It teaches you how to highlight a HanJa (Chinese/Korean) character image on your screen and automatically convert it to text. It really speeds up translation and avoids drawing or typing HanJa characters. 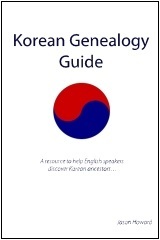 The printed version of Korean Genealogy Guide is available at https://www.createspace.com/3827253. It is also available from Amazon.com at http://www.amazon.com/Korean-Genealogy-Guide-resource-ancestors/dp/1475050151. A free electronic version is available at Korean Genealogy Guide. It is the author’s hope that this will help those searching for Korean ancestors.